There are three state parks on the north coast: Mount Tamalpais, Samuel P. Taylor, and Tomales Bay. The triple-peaked Mt. Tamalpais features the highest mountain in the area with excellent views of the coast. It is an area of mountains, valleys, and thick forests with ample opportunities for hiking and biking. A rugged scenic drive goes across the three peaks. Samuel P. Taylor offers hiking and recreation along Bolinas Ridge while Tomales Bay features beaches and picnic areas on both sides of the sheltered bay. Mount Tamalpais State Park. 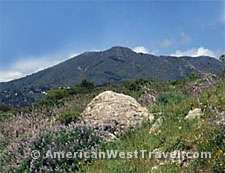 The park is named for Marin County's highest peak, Mt. Tamalpais (or Mt. Tam, as it's known locally), elevation 2,571 feet on its East Peak. The peaks provide outstanding views of the coast, and on clear days the Sierra Nevada may be visible far to the east. The park offers a diversity of terrain ranging from pockets of ancient redwoods in deep canyons to ridges and hillsides covered in chaparral, grasslands, and oak. Lush ravines start on the hillsides and run all the way to the coast. The Pantoll Ranger Station, located on the Panoramic Highway at Pantoll Road, offers park info. Mt. Tamapais Visitor Center is near the east peak summit. It provides exhibits and information, and is open on weekends. Phone (415) 388-2070. Access to the park is on the Panoramic Highway from Highway 1, via Stinson Beach to the north or Mill Valley to the south. To reach the peaks, take Pantoll Road from Panoramic Highway, then East Ridgecrest to the summits. There are over 50 miles of trails in the park. One popular trail follows the grade of the old Mt. Tamalpais and Muir Woods Railroad, known as "the crookedest railroad in the world", to the top of Mt. Tam. The railroad once brought tourists from Mill Valley to the summit. Read the Railroad Grade, Fern Creek Trails narrative. The Steep Ravine Trail runs all the way to the coast at Rocky Point where Mount Tamalpais State Park offers popular cabins and campsites by reservation only. First-come first-served camping can be found at the Pantoll Campground near the ranger station. Sixteen sites are available. Two group campground are available by reservation. For information, call (800) 444-7275. The historic Mountain Theater built in the 1930s by the CCC on Mt. Tam hosts special events. A local theater company, Mountain Play, stages a musical here once a year. Samuel P. Taylor State Park. The park offers a diversity of woods and grasslands on Bolinas Ridge above the Olema Valley. Sir Francis Drake Boulevard runs through the park providing easy access. The park has a modern campground with 61 sites. Showers, flush toilets, and piped drinking water are provided. Two group campground are available by reservation. For information, call (800) 444-7275. There are also a picnic area, group picnic areas, and even a swimming hole. There is a network of trails for hiking. Some trails allow equestrians and bicycles. The paved Cross Marin Trail follows an old railroad bed and is excellent for bicycling. Dogs are permitted on-leash in most areas. Tomales Bay State Park. The park offers waterfront access on both sides of Tomales Bay. On the east side California Highway 1 runs through the park about nine miles north of Point Reyes Station. There is a picnic area and day-use beach access at Millerton Point and Sieroty Beach. The four small beaches on the west side of Tomales Bay provide especially pleasant recreation as the elevated Point Reyes Peninsula provides shelter from the prevailing winds. The sheltered water is warmer and possibly tolerable for swimming. Heart's Desire Beach is the most developed, with car access, a picnic area and restrooms. There is a small network of trails connecting the four beaches. Also, a nature trail to Indian Beach and a trail to the Jepson Memorial Grove of virgin bishop pine trees.